Russia has launched its most dangerous nuclear attack submarine EVER - which can strike targets on land 1,500 miles away. 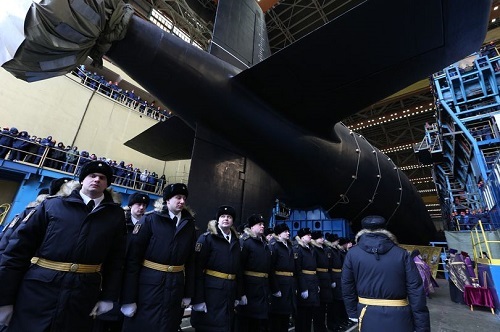 Much secrecy has surrounded the construction of the 'top secret' Project 885 Yasen class fourth-generation Kazan nuclear submarine since work began in 2009. But the high-tech vessel set sail to huge fanfare at the Sevmash shipyard in Severodvinsk in northern Russia on Friday - when the sub’s commander Captain Aleksandr Beketov smashed a bottle of champagne over its hull. One of the most dangerous machines on the planet, the sub is rumoured to be intended by Vladimir Putin to evoke memories of the Soviet Cold War era for a nation in need of a morale boost. The Russian military as a whole is finding life harder since the collapse of the Soviet Union in 1991 - after which its navy was forced to scrap many of its relatively new ships and keep others in harbour due to its lack of funds. Russian submarines have meanwhile recently increased patrols to a level last seen during the Cold War era. And a recent boost in funding has enabled the Russian navy to develop technological advances beyond those of its Western counterparts.